Having struggled my way through the author’s previous book twice I approached BARRACUDA with more than a little trepidation but it only took me a few pages to realise it was a book I could lose myself in So I did. At 14 Danny Kelly dreamed of being an Olympic champion swimmer and had enough raw talent to win a scholarship to an expensive private school with an excellent swimming program. The school was a long way – both physically and metaphorically – from his working class home in Melbourne. When the book opens we meet Danny – or Dan as he prefers to be called by then – as a twenty-something man, standing on the shores of a Scottish lake. The locals think it’s hot enough for swimming but Dan stands on the shore fully clothed, thinking “The sun feels weak to me; It can’t get any stronger than pleasant, it can’t build to fire, it can’t manage force”. BARRACUDA is the story of how Danny went from being that dream-filled boy to a homesick man still yearning but for something less tangible, perhaps even less easily attainable, than an Olympic medal. Danny is a remarkable character. His gift sets him apart in some ways but overall it is his ordinariness that lingers. Because I bet you have more in common with a half-Greek, half Scots-Irish gay lad from Melbourne who has been to prison than you might think. Because who hasn’t felt like an outsider at some point in their life? Who hasn’t felt like a failure? Or the shame that accompanies not being able to stop yourself from doing something wrong? Or the kind of embarrassment that only a teenager can feel in the presence of their parents? Or the shattering belief you’ve let down the people in your life who least deserve it? Danny experiences all of this and much more besides and there isn’t a moment where I didn’t feel invested in learning more about these experiences and how he would live through them and cope with their aftermath. I suppose Danny isn’t likable in any traditional sense but he is believable. Admirable. Lovable. The two themes that seem to be mentioned most in the reviews I’ve finally read now that I’ve finished the book myself are that it explores the class divide that supposedly doesn’t exist in our mythically classless country and the obsession we have with sports and what we’ll forgive or forget if someone is good at it. If they can win. Though I can certainly see these elements and even identify quite personally with some of this exploration, particularly the awkwardness that comes from realising you have moved into a different world – a different class – from the one your parents inhabit, neither of these are what really stood out for me. 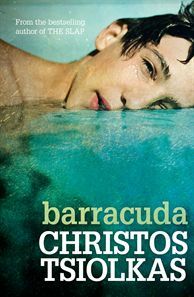 What I became so thoroughly engrossed by was the way BARRACUDA explored how to grow up. How to work out what kind of person you want to be and then how to get to that point, especially after stumbling. Can you make a conscious choice to be a good man? What if you’ve done a bad thing? What will other people forgive? What will you forgive yourself? I am also still thinking about the way the book shows how our image of ourselves is usually vastly different from the image others have of us. And both of those are often different from reality. In BARRACUDA this applies equally to people and places. Adult Danny’s Scottish boyfriend Clyde is full of unkind but accurate observations about Australia and while these are interesting in themselves what lingers more for me is this notion that often the most incisive observations come with distance. And that no matter how much you might agree with the criticisms of your home you can still yearn to return to it. Especially if you’re in a place where the sun can’t manage force. BARRACUDA has the grit and darkness of its predecessor. Even some of the language. But it has light as well as shade and not every character was hell-bent on destruction (of self or a loved one) which was what made THE SLAP so unpalatable to me. It’s not perfect. It is, for example, a little long and there’s a couple of threads, such as Danny’s excursion with his mother to visit the Jehovah’s Witness family who have disowned her, that don’t really add much. But I loved it anyway. Its flawed central character. Its heartache. Its unanswered questions about my country. The way its non-linear structure kept me completely engrossed. This entry was posted in Australia, book review, Christos Tsiolkas (Aus). Bookmark the permalink. I still haven’t read The Slap, though I did get as far as buying a copy. Maybe I should start with this one. I think you can start anywhere and I personally can’t recommend THE SLAP – it made me so miserable (though the novel before that, DEAD EUROPE, was good if you want some sense of his earlier writing). I’m not really interested in reading The Slap, but I’m keen to read Barracuda, on the basis of your response to it, Bernadette. Bernadette – I’ve been wondering about this one. Like you I’d read some good things about it. This one certainly sounds compelling and I like the way that larger questions and issues are brought down to a very human level. That’s the best way to explore them I think. So glad you enjoyed this one, Bernadette. What I’ve always admired about Christos’ books is that he shows Australia as we are, not as how we like to think of ourselves. Barracuda has a redemptive element that is absent from the other books, yet it is not remotely sentimental. I think this is a great achievement. I’m glad you influenced him to write about a good person Angela…probably harder than any other kind for him but he’s done a great job and no I wouldn’t call it sentimental at all. I think it’s a great book for blokes so I’m sending a copy to my brother. I read the Slap and did enjoy it, but it was one of those books that afterwards I became less satisfied as I thought about it. I have read a couple of reviews of this one and wasn’t sure whether I wanted to read it or not – yours has been by far the most helpful review. Thanks Bernadette….